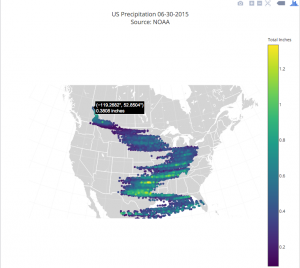 Static version of an interactive plot.ly map showing precipitation on 30th June in 2015; please click image to go to the interactive version. The Live Data project aims to support academics in creating interactive visualisations using a variety of cloud-based visualisation services that can be embedded within academic journal articles, blogs and websites. To achieve this the project has been funded from October 2015 to March 2017 by the Research IT Board to build visualisation case studies from across the University and to develop software agnostic workflows for the creation of interactive visualisations. A calendar of events dedicated to Open Data and the usage of interactive visualisation as research impact. The team responsible for delivering the Live Data project included; Howard Noble (sponsor), Martin Hadley (PM and technical lead), Ken Kahn (developer) and Rowan Wilson (3d visualization and Blender expert).